The foundation for a lasting and thriving organization is most often built on the creation of a clear company culture that is embraced and practice by a dedicated team of employees. But sustaining staff buy-in and ensuring longevity as a company grows and evolves is a bit more complex. Balancing a high local cost of living with pay rates that are lower than in comparable areas and offering the right incentives to retain the right employees – all while juggling policy, procedure and health insurance paperwork – can be a challenge. 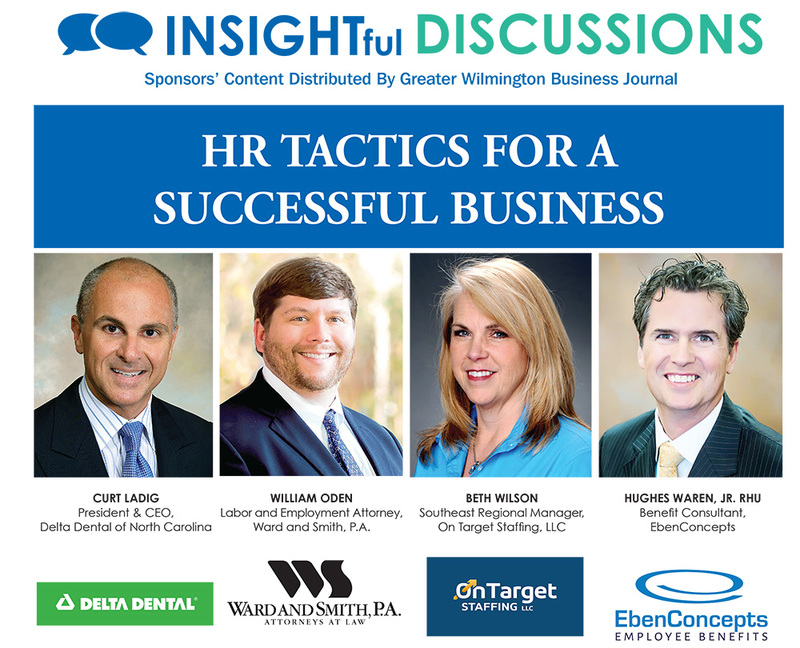 We asked a panel of area experts for their advice on effectively managing human resources to ensure overall company success. What makes the Cape Fear region’s employment market unique and/or beneficial? WAREN: Our employment market is unique because of our location and quality of life. Employers have access to big city business resources with the small-town coastal life for employee’s family life. LADIG: The Cape Fear region is unique in that there is an amazingly diverse collection of employers here, as well as a unique quality of life not available in many other places. In this region, we have major employers, like GE, PPD and Corning, as well as top health care providers and terrific academic institutions. The tourism and hospitality industries also play a critical role in the region’s economy. This can often mean a more transient talent pool and lower-wage jobs. It also often means employee benefits are not a part of the equation for overhead costs. What challenges do you see in the region’s job market? BETH WILSON: Wilmington has such a diverse job market. It is hard to say if there is just one niche of business in the region. Certainly, from a staffing point of view, our greatest challenge is lower pay rates compared to other areas of the state, such as Charlotte or Raleigh. Pay rates for a similar position in Raleigh are significantly lower here in Wilmington. This is exacerbated by the fact that housing costs are higher here than in Raleigh. It is challenging to try and fill lower-paying positions because payrates are not realistic for those trying to support a family. LADIG: The challenges we see here are the same challenges seen in most growing communities across the country – the ability to find housing and a qualified workforce and an aging population, among them. The workforce development need offers opportunities for collaboration between employers and our academic institutions to build talent pipelines. What is your advice for balancing the needs of a multigenerational workforce? LADIG: Being aware of the unique characteristics of each generation can also be a starting point for finding commonalities among them. Sensitivity to the varying dynamics across generations aids in building a cohesive team working toward shared goals. What may be most challenging, both to employers and employees, is shaping a culture that can find the balance between being open to new ways of doing business and discerning current practices that still have a place in business operations. WAREN: There is an opportunity for a diverse generational workforce to learn from each other. The older generation has more interpersonal skills and can help the younger generations with their communication development, while the younger generation can help with the technological skills the older generation may lack. Companies need to make sure both generations feel appreciated for the skill set they bring to the company. How should organizations address workplace issues making national headlines, such as the #MeToo movement, gender pay gap and diversity with employees? WILLIAM ODEN: Actions speak louder than words. Schedule anti-harassment training for all employees and managers. This is also a good time to ensure that all related employee policies are up-to-date. Self-audit employee compensation to confirm that there are not any wage gaps between similarly-situated male and female employees. If there are some wage gaps, what is the business reason? In that instance, you may need to consult an employment attorney. Depending on the size of the organization, you might consider starting an internal diversity committee to give voice to – and serve as a sounding board for – diversity issues. WAREN: The Equal Employment Opportunity Commission (EEOC) reported in October that a panel of consultants recommend that a holistic approach is needed from employers to change workplace culture to prevent future harassment. Organizations must utilize a multifaceted campaign that focuses on leaders who create the right environment, conduct a workplace assessment on the culture atmosphere, and create training formats that inspire employees to implement a more positive environment that works for everyone. LADIG: It starts at the top with leading by example. Educating employees on acceptable, professional behavior and the policies in place to respond to behavioral violations help manage risk. Gender pay gaps can be avoided by using data-driven policies for salary decision-making, including market data and equal base salaries for the same jobs with adjustments for education and years of experience. As for diversity, we know that a diverse workforce leads to better over-all company performance. Actively seeking to broaden candidate pools and being intentional in hiring practices helps diversify the workplace. At Delta Dental, 75 percent of our management teams are female. Beyond salary, what incentives can employers offer to retain quality employees? WAREN: The Affordable Care Act (ACA) individual health insurance marketplace policies have become unaffordable unless individuals qualify for advanced premium tax credits (subsidy) to reduce the cost of premium. In 2019, married couples between the ages of 30 and 34 without children cannot receive ACA marketplace subsidies if their household income is greater than $65,000. Due to this income factor, we believe the number-one incentive other than salary for businesses over 10 employees is an employer-sponsored health plan. The employer’s contribution to the employee’s premium is 100 percent tax-free to the employee and tax-deducted by the employer. The employer contribution to premium does not count as income to the employee. Also, if employees share in the cost, their premium can be run through an IRC section 105 POP plan for pre-tax payroll deductions. Tax savings on both sides reduce the net cost of a health plan to employees. WILSON: Although money is a motivating factor for most people, recognition goes a long way to motivate also. We offer referral bonuses, giveaways and raffles for employees who are in good standing. We began an employee appreciation campaign to constantly recognize and thank our employees for a job well done. When employees know they are appreciated they are happier workers and less likely to be prone to absenteeism. Temporary staff have a history of being treated differently than their permanent counterparts at work locations. It is up to us, as their employer, to make them feel valued and important. Clients are important, of course, but our employees are the ones who make us successful. LADIG: Dental, vision and medical benefits top the list of differentiators when choosing between higher- and lower-salaried job opportunities. ODEN: A flexible work schedule, allowing for working remotely, when possible, recognition for employees who have worked long enough to hit certain milestones, 401k matching, help with the repayment of student loans, and a seat at the table in terms of being able to provide input and be heard by those who are in charge are all good options, to name a few. Ask your employees what they value and what incentives or performance-based rewards that they would like to see. You really are only limited by your imagination. What are the most common mistakes businesses make with their benefits packages? WAREN: One of the common mistakes is not communicating the purpose, value and details of the benefits provided to employees. Employer-sponsored insurance plans are a huge perk to employment packages and HR departments, along with their benefit brokers, should communicate them effectively. LADIG: Limiting education and communication is a mistake that businesses – both small and large – make with regard to their benefits packages. For example, dental insurance usually pays for 100 percent of preventative services (exams, cleanings, x-rays) performed by dentists, yet less than half of those with dental insurance visit the dentist annually for fear of high costs and additional services to be recommended. Encouraging employees to choose an in-network dentist and visit their dentist routinely are two simple ways to assist employees in efficiently utilizing their benefit dollars that will also save money for the company. Informing employees about the most efficient use of their benefit dollars is a tough task. Businesses that invest in open enrollment meetings, Q & A sessions with benefits professionals, and/or benefit fairs are making valuable efforts to make information readily available to their employees. How can businesses weigh their benefits packages against the competition? LADIG: The first place to start is to determine what you are trying to achieve. What is important for you to attract and retain a quality team of associates to drive the results you desire in your organization? Align those goals and values with benefit providers who can align with yours. It matters whether you are looking for benefit partners or just vendors. Be sure the benefits you provide send the message you want to convey to your associates who will ultimately determine your organization’s success. The right benefits professional can assist in finding the right fit for businesses, small and large. WAREN: Many human resource consulting firms have access to national benefit package surveys broken out by industry to use, so employers can create new benefit plan incentives to help attract new hires in a competitive employment market. How important is a company’s culture and mission statement to employee satisfaction? ODEN: Building and maintaining a good company culture is extremely important. However, it is equally important that, as the business grows and changes, the company be allowed to flex with the business – namely, hold on fiercely to those culture aspects that are critical but be willing to pivot on others as the market, customers and/or employees’ needs change. I do not put much stock in mission statements, unless employees have been given substantial input in their drafting to ensure buy-in. How the mission statements are acted upon, if they exist, is what matters most. LADIG: I will start with the mission statement. Our mission statement – to improve the oral health of the communities we serve – is both taken to heart by each of our team members and at the heart of everything we do. It is our mission that defines our culture of service. If an employee does not buy into a company’s mission, then assimilating into the company’s culture will remain a challenge and job satisfaction will be hard to obtain. WAREN: It is incredibly important but reflects the approach that each employer takes into the process of hiring and “taking care of ” their employees. These vary significantly between those who do what they must to those who take a nearly parental interest in their employees’ needs. How to best accomplish this is very often a direct reflection of their owners’ and/or executive team’s approach to the importance of their employees’ long-term relationship. WILSON: I believe a company’s culture is essential to employee satisfaction. If an employee is not happy with their environment, the chance that they will have any longevity in a job is very low. Employees who believe in their employee’s mission statement and company culture are more engaged. Engaged employees are more positive in their approach to work and more motivated to achieve their goals within the organization. It is one thing to go to work every day and collect a paycheck, but when employees believe in what they do and what their company stands for, it is a pleasure going to work and the sense of satisfaction achieved often outweighs a lower pay rate. How often should businesses review and/or update their employee handbook and company policies? WAREN: This is best done on an annual basis. Review all state and federal laws to make sure your handbook is compliant. If your employee count has increased, you may now be responsible for complying with COBRA, ADA, FMLA or many other regulations that smaller companies are not required to meet. ODEN: Businesses should review their employee handbook and company policies at least annually. Ensure that you have the right policies in place for a company of your size. A written employee handbook/ policies can actually hurt a company, if they do not comply with current federal and state law and/or are not administered consistently. What are a few of the most common HR growing pains that small and midsized organizations face? WAREN: There are a number of things that we deal with regularly with our clients: (1) a growing obligation of regulatory and legal compliance issues that they face -- from state and federal discrimination laws, OSHA, wage and hour, and especially Obamacare requirements to offer coverage and do reporting; (2) the complexity of purchasing various benefits, with differing means of underwriting and financing health care and the benefits available to be offered to their employees; and (3) the type and complexity of employee issues that crop up on the HR side, from hiring to termination. ODEN: First, very small companies in North Carolina (less than three employees), may not realize that once they reach the three-employee threshold, they are required in most instances to carry workers’ compensation insurance. Failure to maintain workers’ compensation insurance, when required, may result in harsh civil and criminal penalties. Another issue I encounter frequently is the misclassification of employees as independent contractors. Do not treat someone who should be classified as an employee as an independent contractor to save money. Misclassification can result in back wages and overtime being owed, plus, in some instances, double damages and the employee’s attorneys’ fees being owed – not to mention having to reimburse the worker for anything else of value (health insurance, retirement, etc.) that he/she would have been provided had they been properly classified as an employee in the first place. Finally, I still see quite a few companies inappropriately treating non-exempt employees as exempt. When in doubt or if it is a close call, speak with your employment attorney. LADIG: Finding quality talent in a tight labor market is a significant challenge. While smaller organizations may not have some of the bells and whistles of a larger company, the ability to work in a smaller organization and to see the results of our efforts in an organization that can move more swiftly to market can be rewarding. What HR legal issues should companies be most educated about and updated on? Drug-testing laws, because they differ by state LADIG: Ban the box, pay equity, paid family leave, harassment, immigration, and recreational marijuana. WAREN: We find that most of our clients have gotten either no advice or bad advice on benefits-related compliance issues that they face – from rules about to whom they should offer coverage and satisfying various reporting obligations t0o providing necessary notices to their employees and answering the unexpected calls or letters from the U.S. Department of Labor or the Internal Revenue Service. Our decision was to give our clients specific answers to their questions and to defend that advice. What are some strategies for effectively managing a remote workforce? WAREN: Communication is key when managing remote employees in multiple locations. We recommend that these types of employers partner with an employee benefit firm that has a benefit/HR portal for employees access. These types of benefit portals usually have the ability for preloaded video training for workplace concerns like harassment. They also have mobile apps, which work well for push notifications to all employees to distribute important HR information critical to employees. WILSON: When companies have a remote workforce, as we do, it is essential to create an environment of inclusiveness. Often, employees who work remotely tend to feel like outsiders. Good communication is a key factor in making remote employees successful. Weekly conference/video calls are a great way to stay connected and ensure that everyone is on the same page. It is important to build relationships with remote workers and schedule regular visits to help facilitate a feeling of inclusion. Employees should have easy access to necessary files via programs like Dropbox and Google Drive. It is also important to recognize remote employees for their efforts to help promote your company’s culture. ODEN: Frequent check-ins with each remote worker, in-person, regular (semi-annual or at least annual) performance evaluations, just like for your onsite workers, and clear, written job descriptions and expectations go a long way toward managing a remote workforce. Ensure that each non-exempt, remote worker submits accurate time records so that they are paid appropriately, and also make sure that you understand the difference between being engaged to wait and waiting to be engaged, as the former can often constitute compensable time. LADIG: Trust is at the foundation of a policy that allows employees to work remotely, so investing in hiring the right people is a key strategy for success. Providing the right technology and software solutions, making sure security measures are in place to protect both hardware and company data and communicating policies clearly and consistently are components of a successful program. Managers need to set expectations with their employees and ensure lines of communication are open among all team members, including management. How do you manage work-life balance in an organization? ODEN: Providing adequate paid time off/vacation leave for employees and requiring that a majority of it be used during the calendar year during which it is provided (use it or lose it), while also making sure that employees are afforded the opportunity to use and enjoy their paid time off/vacation leave is one way to help manage work-life balance in an organization. But ultimately, it is up to each employee to figure out what works best for him/her. LADIG: Here is another area where leading by example is key. Establishing and maintaining boundaries between work life and personal life for yourself and respecting those of others help. There may be times that require additional time and effort to be invested in a project. Making sure employees take paid time off and setting the expectation that they will disconnect and offering flexibility in work hours can lower an employee’s stress level, making them a healthier, more productive team member. WAREN: The growing role of technology in our daily lives sometimes unfairly presents expectations for employees to always be connected and blur the lines between work time and personal time. The work day never seems to end. There are times when human resource departments should assist employees to determine when to shut their phone off and enjoy the moments away from work. Another important factor is encouraging employees to limit timewasting activities at work, like web surfing, Facebook, personal calls, etc., so they can be more productive in a 40-hour work week. When this occurs, turning the phone off away from the office doesn’t create stress.